Giraffe was one of the first Asian noodle bar restaurants in Tel Aviv and its popularity hasn't changed since then. 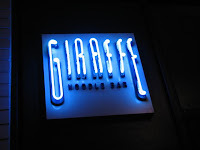 Combining the Asian flavors such as Japanese, Thai and Chinese on their menu, Giraffe is attracting a big crowd. There's a lot to choose from on Giraffe's menu and can be time consuming... Among the appetizers, we liked the tofu salad with vegetables and peanut sauce. The shrimps egg roll had a very weird smell, so it's definitely not one of our favorites. Giraffe also has several types of sushi, but Giraffe is not the place for it. We rather eat sushi at a better sushi restaurant, like Sakura and Japanika. 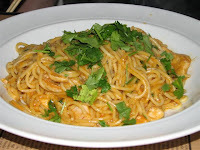 Our favorite main dishes are the "Spicy Philippine noodles" and the "Lemon chicken". 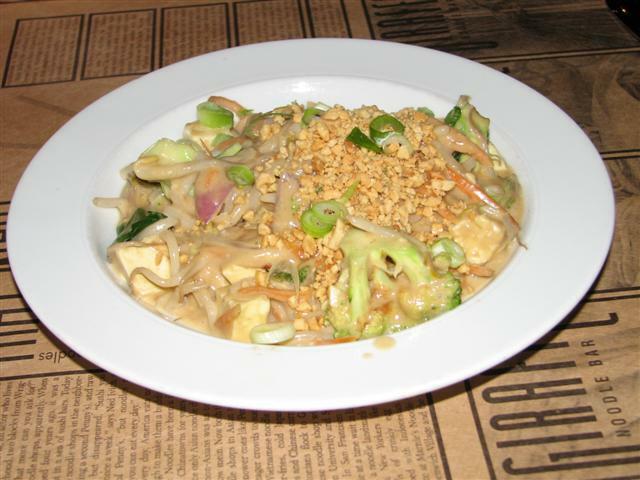 The Philippines dish is prepared with coconut milk mixed with a red curry paste and pieces of chicken. It's a little bit spicy for sensitive taste buds. The Lemon chicken is great! Slices of crispy chicken, served with fried white rice and a tangy-savoury lemon sauce. Moadon HaKtzinim (Officers' Club) is a chic branch of Giraffe. The menu is a little bit different, but based on the same idea. To reach the Ibn Gvirol branch: if you're coming from Dizengoff, take left when you hit Ibn Gvirol st.
To reach the Officers' Club: Ha'Arba'a street is next the Cinemateque, on Carlebach st. You can reach Carlebach by going to the beginning of Ibn Gvirol (go south), where it connects to Yehuda Halevi st.
Last night five friends and I ate at Giraffe. The food was great and the atmosphere was nice BUT later that night four out of the five of us who ate Pad Thai became sick with stomach pains. It was very unpleasant. We then called to inform Giraffe at the location we at ate, so other customers would not get sick as well, and the first person we spoke to was nice but then we were transferred to a supervisor. This person was rude to my friend and dismissive about the compliant and warning. Being sick was one thing, being ignored is a whole other issue and problem. I am very unhappy and upset with Giraffe. I will probably never eat at Giraffe again and will share this experience as a warning to others.